Mindscape in Words: 6 Things You Shouldn't Forget When You Have A Busy Life. 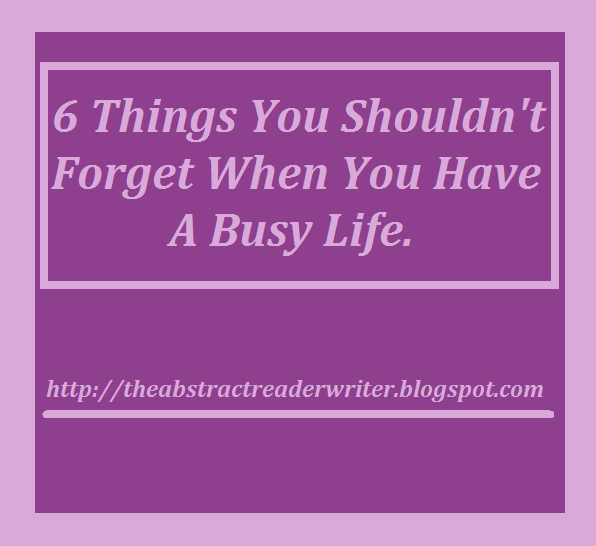 6 Things You Shouldn't Forget When You Have A Busy Life. My college is about to start and I fear that I'll be that kind of person who just gets too busy studying. I fear that I won't get that much time to write and read. I'm sure that this extensive course will take a lot of my time, but my commitment to my blog isn't going anywhere. Perhaps, that was the main reason I'm writing this post. When I'll read this after a couple of months, it'll help set me back on track and motivate me to do the things I love. "Whatever you do in this life, it is not legendary unless your friends are there to see it." I think that even when you're piled up with lots of assignments, you shouldn't forget about these things. I think that even when you're at a top position career-wise, you shouldn't forget about these. I think that when you're hurt or sad, you should remember these things. These are some of the things you should never let go. They are your true possessions and treasures. Here's the list of what you shouldn't ever forget no matter how busy you get in your life. When people work 80 hours a week, they hardly get to spend time with their family. Working all the time is not good for your physical and mental self. You must spend time with your family. When you talk to your parents even for some time, it makes them happy. When you have a nice conversation with your spouse, your marriage stays healthy. When you play and talk with your kids, you get so much love back. When you talk with your siblings and cousins, you'll enjoy their company. When you show up at a family get-together, you know how everyone will be delighted. And you can bet that you'll have a great time. Staying in touch with your family is the most important thing. Even if you lose your job, they'll always be there to support you. So make it a habit to be with them and cherish the fact that they are in your life. Friends are our second family. They are the people we always turn to when we need some advice from people our own age. If you are so busy with your lives then so are they. It's not like the old college days. You can't all just bunk your office to watch a movie and hang out. Those days, as amazing as they were, are now over. Instead of wishing that, you could just meet them and share the happenings in your lives. Sharing is caring. And when it comes to friendships, you should share everything with them. Maybe they're also going through the same stage as you are. Maybe, they might have some brilliant ideas to get you out of trouble. And if you're not in trouble, they'll be more than happy to know that you're doing well. After all, they are the people who once believed your crazy theories and joined you in them. The least you can do is meet each other often and not let your precious friendship go away. It's almost impossible to keep up with your hobbies when you lead a busy life. But the thing that you love to do is what your passion is. Even if you're working too much right now, you might have that something which you always wanted to do and I think you should never let go of that passion. If you are an amateur photographer, then you must keep taking pictures whenever you can. Even when it's just of the birds from your balcony. You shouldn't lose that touch. If your ultimate aim is to write a novel, then you must always keep that in the back of your mind and keep writing something every day. If you won't get time, create it. You can always use the time to and from your office for such things. Just never dull that sparkle. It might be difficult to get 8 hours of sleep or proper food intervals or time to exercise. But these are not options. These are the things that are a must to live a healthy life. Short hours of sleep will make you drowsy, irritable and inefficient at work. If you don't eat properly at stipulated intervals, you might get sick or tired. If you don't workout, you'll tend to gain weight because of your sedentary job. You must at least try to get all these things in correct proportions. Skipping few hours of sleep or skipping breakfast or skipping a workout session is not right. It'll start with one day and turn into a habit. So try to stay fit. Your mental health is strong because you work. But if you hate your job or get tired of that busy life, you can get yourself in trouble. Excessive working isn't good. You may get stressed or depressed. You can't let that happen to you. To keep your sanity, you should do something apart from you job. You could read newspapers or a humorous novel. You can play some sport with your friends. Or you can meditate which is the best thing for relaxation. Don't go crazy. Sometimes people commit themselves to their work so much that they forget what they're doing. They get trapped in a maze and then it becomes difficult to get out. Sometimes people become obsessive about their job that all they talk about is their job. Don't let yourself get carried away. Keep your sanity and remember that it's only a job which helps you to do what you're best at. There's no point leaving the people in your life for it. There's no point in worrying at all. Just be the person you always were. How do you manage to keep everything perfect while leading a busy life? Do share. Great post and GREAT advice. As an older student I still get tripped by these things - especially forgetting things like physical health - it's so much easier to NOT go for a walk. And let's not talk about the week I was so busy with assignments that my teens complained that "mum needs a shower and clean clothes". Thanks for sharing. A great reminder! Life gets so busy and sometimes you look back and think... where did that time go, I wish I had spent more time with.... I should have been around for .... This is great advice to always keep in mind, even as hard as it is sometimes!! Such a good advice! I feel that, as we get older, we kind of forget of spending time with those we love and doing what we enjoy doing the most! As hard as life gets, we need to remember to live it as well! These are all very good reminders. Some things really are more important than others in life and it's good to call those out. Great post! I am actually writing something similar at the moment. We get so busy as we get older and I think a lot of the things we used to make time for fall by the wayside. It is definitely important to make sure we continue to not only nurture our relationships with others but to nurture the one with ourself too. Really struggle to remember #2, #5, #6! Absolutely! All of these are important, and can't be easily brushed aside just because life gets crazy busy sometimes!